> DataStax > Are Your Technology Decisions Killing Your Customer Experience? Today’s customers expect a seamless, intelligent and personalized experience that operates at the speed of the cloud and is continuously available regardless of location or platform. To deliver an optimal customer experience that will enable you to stay ahead of competitors you need a distributed, responsive and intelligent architecture which is only possible when the right database is in place. 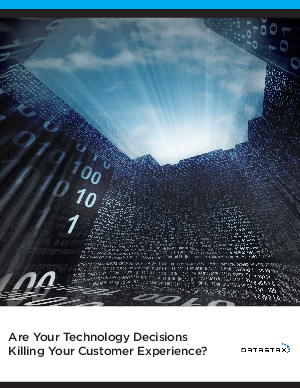 Read this eBook to learn how your database technology decisions can affect your ability to deliver either a transformational customer experience or a lackluster, dissatisfying encounter that benefits your competitors, not your bottom line.